The Scott's Oriole is 7.5 - 8.25 inches in length and have a sharply pointed bill. Males have a black head, breast, back, wings and tail with a bright yellow belly, rump and shoulder patch and a white bar on their wing. Females are duller in color with greenish to brownish heads, chests, and backs, dull yellowish bellies and two wing bars. Scott’s Orioles live in a variety of arid habitats from sea level to 10,000 feet in elevation. Preferred habitats include desert canyons, pinyon-juniper foothills, and semiarid plains between mountain ranges. The breeding range of the species includes Arizona, Baja, California, Colorado, Idaho, Mexico, Nevada, New Mexico, Texas, Utah, and Wyoming. Scott’s Orioles are migratory, moving south in fall and spending the winter months in Mexico. The bright colors of the Scott's Oriole in the photograph give it away as a male. Scott’s Orioles feed mostly on insects and insect larvae, which they pick from the ground or glean from vegetation. In their wintering grounds in central Mexico, they eat monarch butterflies which other birds have difficulty digesting because of poisonous chemicals that accumulate in the butterflies from the consumption of milkweed. Scott’s Orioles also eat nectar and fruit, including those of cacti. 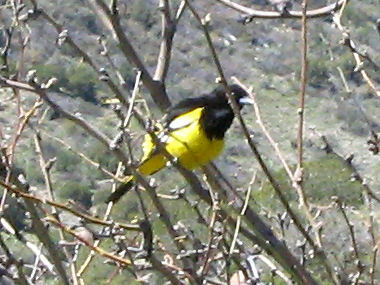 Scott’s Orioles nest in many species of trees including yucca, palms, pinyon pines, junipers, and oaks. Nests made of leaf fibers (especially from yucca) or grass, and lined with soft plant material formed in the shape of a hanging basket. Nests are well concealed and shaded, usually 6-10 feet from the ground. Clutches consist of 3-5 bluish-white eggs. It is thought that only females incubate eggs and brood young, though both sexes participate in feeding and defending the nest from predators. Pairs may raise two or sometimes even three broods in a single summer.